For established accounts, payment is net 30 days from receipt of goods. Interest is charged at 1.5% per month and 18% per annum on overdue accounts. All prices are F.O.B. Tree to Tree Nurseries Ltd., Gleichen, Alberta. Prices are subject to change without notice. The prices listed herein are for wholesale trade only. All prices are in Canadian funds. GST will be added to all prices listed. 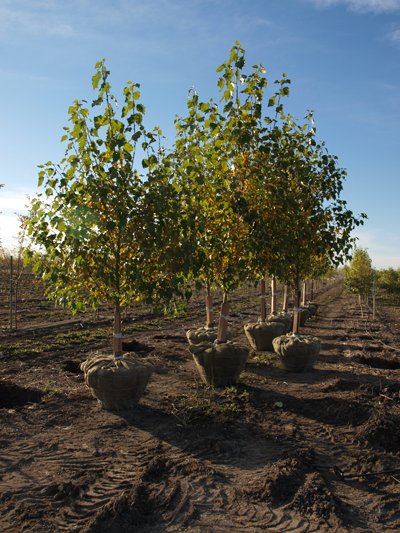 Tree to Tree Nurseries Ltd. guarantees that plant material is true to name and viable when shipped. Tree to Tree Nurseries Ltd. makes no guarantee for the survivability of plant material after delivery, as it is subject to conditions over which we have no control. All claims must be made within 48 hours after the receipt of the plants. Tree to Tree Nurseries Ltd. prides itself on the safe and timely delivery of plants to your jobsite or desired location. We will communicate closely with you to confirm time and location. For reliable and timely service, please provide 48 hours notice for deliveries. Our picker truck and trailer rate is $130.00 per hour and can handle 26-36 trees, depending on root ball size. For larger orders, a common carrier will be arranged as requested. Our picker truck and trailer rate is $125.00 per hour and can handle 24-33 trees, depending on root ball size. For larger orders, a common carrier can be arranged at the customer’s expense. For customers that wish to pick-up trees at the nursery, our staff will pre-pull the order and assist the driver in loading, strapping and tarping. © 2019 Tree to Tree Nurseries. All Rights Reserved.